Dura Grip High-Performance Anti-Slip Epoxy is an epoxy coating specifically designed to provide a hard, durable barefoot-friendly textured surface on a variety of substrates. It is ideal for use on diamond-plate metal ramps, boat decks, trailers, stairs, locker rooms, laundry rooms and other residential and industrial areas where anti-slip protection is desired. 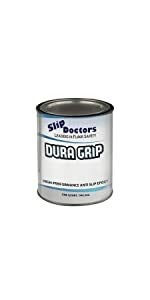 Dura Grip is available in three sizes and an assortment of colors to meet your needs. 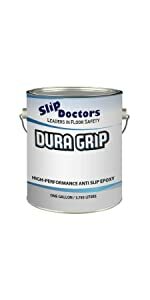 Dura Grip was designed to prevent slips and falls in your home and business. 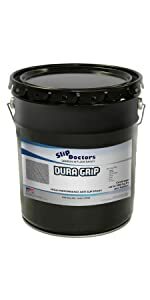 Built to last, Dura Grip is tough and durable and can be used on multiple surfaces. It’s perfect for both commercial and residential and you can walk comfortably on Dura Grip in your barefeet. Easily applied with a 3/8” nap roller (One included per gallon). Clear is also available in a water-based formula. One quart covers up to 75 sq. ft. / One gallon covers 300 sq. ft.
Dura Grip offers a simple and inexpensive solution to reduce the likelihood of slip-and-fall injuries. Application of our high-performance textured epoxy coating provides safe foot traffic in both wet and dry conditions. Single component, oil-based coating is chemical resistant and durable to withstand heavy traffic. Semi-gloss finish is available in 10 popular colors and 3 sizes for maximum results. Barefoot-friendly texture offers anti-slip protection for bare feet and tender paws, making it perfect for decks and patios. Equally effective for tough surfaces such as aluminum ramps, truck lift gates, metal stairs and concrete surfaces.